Best Western Maitrise Suites Apartment. 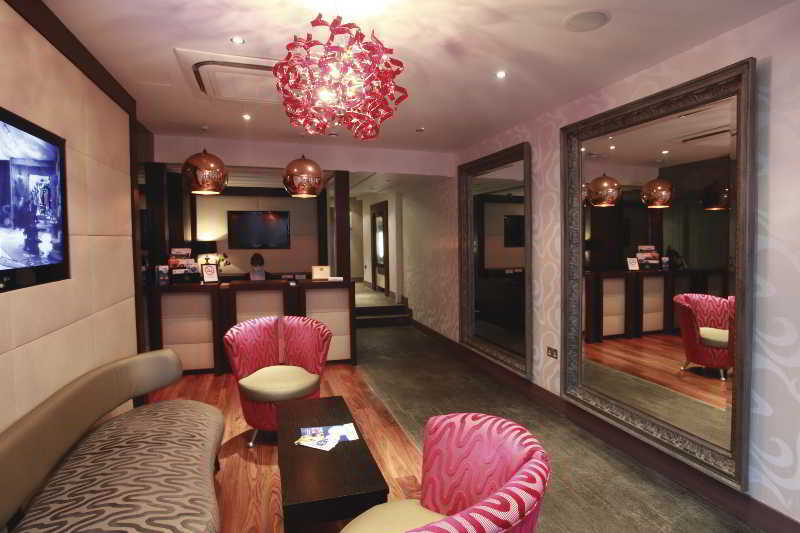 The hotel is conveniently located a short 10 minute walk from Ealing Broadway Underground station. Nearby places of interest include Oxford Circus (16km), Kew Gardens (7km) and Houses of Parliament (11km). London Heathrow Airport is just a 20 minute drive away. 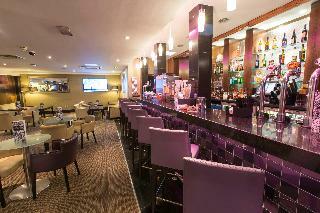 The luxurious hotel is ideal for business trips. Wi-Fi and parking are also available. The boutique-style apartments have orthopaedic beds with Egyptian cotton linen. All rooms have a private entrance, air conditioning and a modern bathroom with quality toiletries. The spacious living areas have a flat-screen TV with a home-cinema system and DVD player. The apartments also have an iPod dock, and some have a private roof terrace. The stylish kitchens feature an oven, microwave, kettle and refrigerator and a cosy dining area. This comfortable hotel is set in Ealing. The hotel features a total of 17 guests rooms. Those staying at this property may keep updated thanks to the Wi-Fi access. Additionally, the premises provide a reception service the whole day through. If visitors ask for it, they can have a cot in their accommodation units. The premises offer accessible public areas. It is possible for guests to bring their pets to the premises. Additionally, a car park is available on the premises for guests' extra convenience. Some services may be subject to additional charges. This hotel is a stylish, modern hotel situated in West London with excellent transport links making it a perfect accommodation option for both business and leisure travellers to the country's vibrant capital city. The 131 tastefully decorated guest rooms boast generous accommodation and some include stuning views of the impressive arch of Wembley Stadium, which is next to Wembley Arena and the Wembley Designer Outlet. Moreover, the hotel is also near Park Royal and Chiswick business parks and only four tube stops from Westfield Shopping Centre at Shepherds Bush. Guests are invited to enjoy delightful dining at this hotel. This sophisticated hotel boasts an ideal location in the quiet suburb of Ealing, offering transportation links to both central London and Wembley Stadium. Visitors may enjoy easy access to a range of fantastic dining, shopping and entertainment opportunities from our convenient hotel. It is also situated within close proximity to a number of businesses and colleges, including the University of West London. Guests may indulge in afternoon tea or sip delicious, pre-dinner cocktails at the chic and stylish bar, where they can enjoy a sophisticated dining experience and a selection of grilled specialties and fine wines. Corporate travellers may host a meeting at this snug hotel in one of the flexible meeting rooms or celebrate a special occasion in our attractive event space. After an exciting day discovering top London attractions, retire to a contemporary guest room featuring pampering bath amenities. Patrons may catch up on work with wireless high-speed internet access or simply relax on the comfy bed and watch the LCD TV. A modern London hotel with free Wi-Fi and breakfast included The chic, design-led Holiday Inn Express® London Ealing hotel is just one mile from rail and Tube services at Ealing Broadway railway station and eight minutes' walk from West Ealing. You can head to central London in 30 minutes and to London Heathrow Airport (LHR) in 25 minutes from Boston Manor Tube Station, just over a mile away. If you're travelling by car, the nearby Deans Garden Car Park offers low daily rates and free overnight parking. Browse stores in the Westfield London shopping centre, 30 minutes' drive from the hotel. Enjoy football? Head to a Premier League game at Wembley Stadium, just over five miles from the hotel. If you prefer musicals, hop on the Tube and go to a West End show, a 30-minute journey away. Make a day of it by visiting the London Eye and other central attractions. Host a meeting for up to eight people in the hotel's smart conference room. 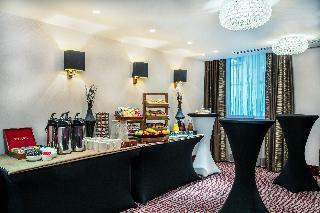 Staff can provide catering and the latest AV equipment, and delegates can enjoy free Wi-Fi throughout the hotel. Power your day with an inclusive breakfast with sausages, bacon, scrambled eggs and baked beans, plus continental options, from the contemporary Express Café, or you can grab a tasty pizza or soup from the all-day menu. Later, pull up a stool at the bright, modern bar or unwind in a comfortable armchair. Most of the staff were great. Location to tube and amenities was fantastic although not much to do at the hotel itself.